Updated Thursday September 6, 2018 by ASL. Here are a few basic soccer rules for coaches, parents and players. The rule for a hand ball includes using any part of the body from the tips of the fingers to the shoulder. The proper way to look at this soccer rule is that a player cannot “handle” the ball. A ball that is kicked and hits a player’s hand or arm is not a hand ball. This means that the referee must use his or her own judgment to some extent in determining whether or not a hand ball is accidental contact or a purposeful attempt to gain an advantage. Put another way, the referee must determine if the play was "ball to hand (legal)" or "hand to ball (illegal)"
the point of the infraction. The basic equipment for soccer required by the FIFA Laws of the Game are: a jersey or shirt, shorts, stockings, shinguards, footwear. According to FIFA, shinguards should be "covered entirely by the stockings, made of a suitable material (rubber, plastic, or similar substance), and provide a reasonable degree of protection. This leaves a lot of wiggle room! Most soccer leagues will not allow a person to play or practice soccer without shinguards. Purchasing good shinguards should be a top priority for every parent. which is dangerous to himself or another player. No necklaces, earrings, nose rings, belly rings, bracelets, or tiaras. Soft "scrunchies" in the hair are generally allowed as are soft head stockings. If a child just had their ears pieced, the studs should be covered with tape or removed. Many leagues will require that the studs be removed. As one fellow tommented, is the hole going to grow back in an hour? Lastly, the goalkeeper must wear colors which distinguishes him/her from the other players, the referee, and the assistant referees. To clarify, both feet must be on the ground when the ball is thrown. The player can hop, run, or do cartwheels up to the point where the ball is released but not when the ball is released. Dragging the toes of one foot is considered legal. Some people also have the impression that a properly thrown ball will not spin. This is not true. A good player can throw the ball with both hands over the head and make the ball spin by applying more or less force to one side of the ball. As long as the motion is over the head and not to the side this is a completely legal throw. For teaching purposes it is common to allow players under the age of 8 to take more than 1 attempt. A corner kick or goal kick is taken when the ball leaves the field across a goal line– you know, either end of the field with a goal. Direct and indirect kicks are two primary ways that play is restarted after the referee stops play for an infraction. For both of these the ball must be stationary before it is kicked and the opposing players should be a minimum of 10 yards away. The 10 yard allowance is often reduced for the smaller age groups and is left up to the discretion of the referee. indirect by looking at the referee. For an indirect kick, the referee will hold one arm straight up in the air until the second person touches the ball. No arm up, it’s a direct kick.There are many soccer rules around what causes a direct or indirect kick. In general, a direct kick comes from a contact foul or hand ball. Everything else is indirect. A penalty kick results from a contact foul or hand ball by the defending team within the penalty area – the large box on either end of the field. So it’s a type of direct kick also. 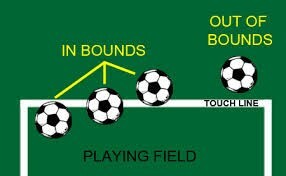 The ball is placed on the penalty spot or mark, 12 yards in front of the center of the goal.